I started playing flugel horn at primary school but I didn’t know what it was – probably due to the inconsistent and curious tuition from the Salvationist teacher employed by Devereux Prep School – I was poor – my schooling was funded by an anonymous benefactor. When asked if I’d like proper lessons I demanded piano lessons. Fortunately my mum worked with Elsie Stott (mother of the famous Kathryn) at Earby Light Engineering which cost a whole 50p. From then on I didn’t look back. I played piano in local festivals and for our school choir and continued playing trumpet at school and in Pendle Youth Orchestra (without tuition). I gave up to play double bass as there were no annoying boys in the section, it was needed, more fun and easier. I got into banding through teaching music at Seaford Head when the school’s tuba player left. I joined Seaford brass band to get a better tuba then gradually moved up the scale through Patcham and then Uckfield (previously Friday Ad) whilst also playing bass in orchestras and singing in opera choruses. I started playing BBb bass for LGB after having my boy Jack then moved to cornet because we had an influx of tubas. It was nice to get back to a smaller instrument but it’s more demanding. 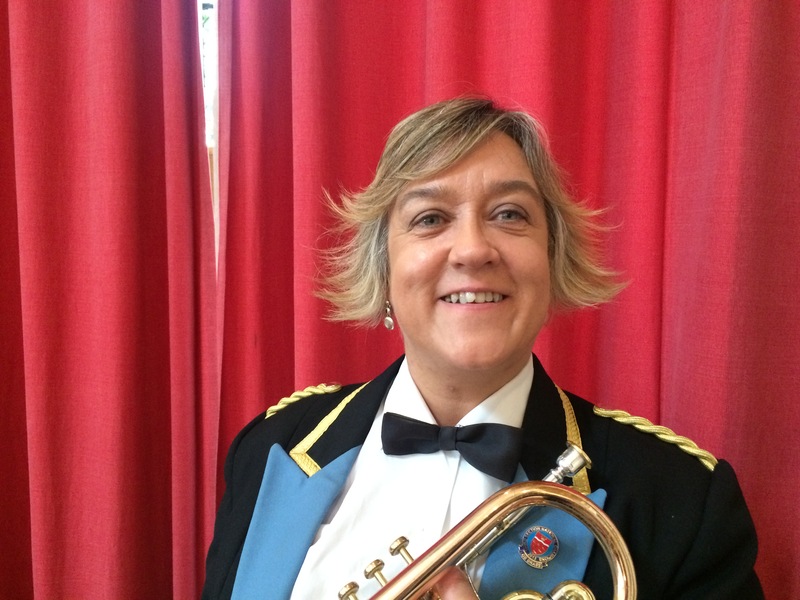 I think the challenge of 2nd cornet is just right for me and like being mother hen to the back row. My favourite piece of music is usually the one we’re working on but I think Penlee has to rank up there with favourite pieces as well as favourite moments when we won the National Brass Band Championships. Although I love teaching and believe that all children should have equal opportunities, there is nothing better than winning! My favourite LGB experience was with our twin town in Waldshut at the Chilbi Festival in 2014. I can’t wait to tour again. This band is such fun to be with whether it’s Whit Friday marches, Eastbourne bandstand, Proms in the Paddock or full scale contesting. 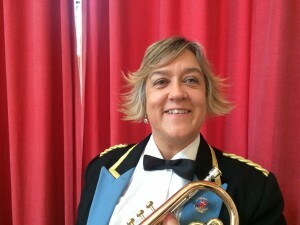 As well as occupying my every Thursday with band, I’m also a manager for East Sussex Music, Chair of Martlets Music Charity, Trustee of Rhythmix Music Charity, mother to Jack the 11 year old trombonist and am owned by lovely Whistles the Lurcher both of whom have toured with the band on various trips.